This is Felino Soriano's second submission, but everyone should check out Counterexample Poetics for unfiltered astonishment. Editor's note: Happy birthday to me! Felino Soriano (California) is a case manager working with developmentally and physically disabled adults. 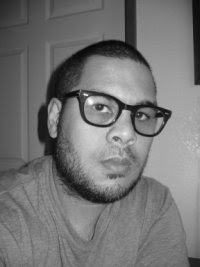 He is the editor of the online journal, Counterexample Poetics, www.counterexamplepoetics.com, which focuses on International interpretations of experimental, philosophical, post-postmodern, and avant-garde poetry, art, and photography. He is the author of five chapbooks and e-books, including Among the Interrogated (BlazeVOX [books], 2008) Feeling Through Mirages (Shadow Archer Press, 2008) and Calling Toward Clarity (Chippens Press, 2009), and also has a mini-chapbook forthcoming from Wheelhouse Magazine. The internal collocation of philosophical studies with classic and avant-garde jazz explains his poetic stimulation. Website: www.felinosoriano.com Painters’ Exhalations 118 —after Bridget Riley’s Edge of Light Light needn’t sky born, or shape create happenstance below, soil level or other cliché developed notion decided on a shelf of predetermination. Birds sketch a clawing scratch vertical road from sky elsewhere leading to twig architecture, feeding opportunity, as light illuminates in constant etching into echoes dissipating only as dusk hands begin the painting of exaggerated gray. Painters’ Exhalations 119 —after Aleksandr Grigor'evich Tyshler’s The Wedding Somewhat deciphered by the citizens whose cataract emotion matches eros amid walkers during night purchasing intimacy through paycheck deposits for affection laced with uncertainty and thought’s edges protruding the forehead’s soft tissue. Here the ceremony unfolded structure capitalizing on sun’s open hand throws italicizing vows and intertwining reading of scripture. Hands exchange third finger symbols casting aside absence for platinum platitude, though the spectrum of smiles erases the monotony of the specialized moment. Painters’ Exhalations 120 —after Mark Cesark’s Grey Area This is language. Two hands held in fisted reality hiding bodies of truth or fiction behind the overused back of trickery asking choice of relevance above interpretational guesses. Human claws at dichotomies. Splaying too far from routine brush blends anxiety into parallel thinking of the body-normality excusing nervousness from the eyes’ visual safety. Many want sharpened edges of black or white. Maze circles segregated or introduced into factual tongues speaking newness— the area of vellum’s spectrum wide wingspan creating inability to travel emotionless away from supported measures the mind ambulates in complete control. Painters’ Exhalations 121 —after José Bedia’s Isla Bonita Impressionist interpretation of a woman’s unworn, strapless, high-heeled stiletto. Stilled away from walking’s many efforts providing a layered rendition beautiful faced woman interrogated by wind’s rhythmic, ugly hands. Trees border the silhouette metaphor walking tired among forest resting near water’s diamond recreation. If man resides here soon the heel will wear, become a broken semblance of identity prior to the overbearing bludgeon of self -righteous motives. Painters’ Exhalations 122 —after Thanet Awsinsiri’s Under the Shade We proclaim protection. Said by the promise of illusion. The protected is not alphabetic dissertations elaborating the body’s many functions. The body bare is at its unpeeled genesis actuating ensuing movement if desire overwhelms stagnant curses tattooing the limbs of extravagant reason. Where wind and walls simultaneously converse.